Cocktail time, March 1930, London: A group of architects gather for cocktails at Mayfair’s smartest Art Deco smoking room. As they settle in the warm interior of dark woods, leather and velvet, London’s bright young things burst in, frosted martinis in hand, surrounded by a cloud of laughter, white smoke and fine vanilla. After-School Pick-Up, September 2014, Seattle: A group of parents gather for lattes at Wallingford’s smartest cup cake café. As they settle in the bright interior of turquoise-colored wood, retro white and black floor tiles, and chrome and vinyl seats, Seattle’s confident, over-indulged toddlers burst in from the daycare center downstairs, book bags in hand, surrounded by a cloud of squeals, vanilla icing and baking cakes. The Architects Club is a sheer, gourmand(ish) scent with good sillage and lasting power, and when I smelled it for the first time, I didn't think of smoking clubs or cocktails but children; it would be a good cologne (sweet, vanillic, light, clean) for youngsters. The Architects Club lists juniper berry oil, angelica root, lemon peel oil, bitter orange, pepperwood, guaiac wood, oak, vanilla absolute and amber as notes, but just a few of those notes stand out in this sheer woody-vanilla cologne. The Architects Club goes on smelling of sneeze-inducing alcohol and dry vanilla, mixing with a hint of orange (likewise dry, not juicy). There’s also a green-cinnamon odor in the background (leafy in character, but a tad foody as well…and very fleeting). See-though wood aromas (accent on guaiac) come to the fore quickly, meld with the vanilla (which is sweeter, and a tad heftier, in the base) and take you through to the finale, where a sweet/fresh musk emerges. 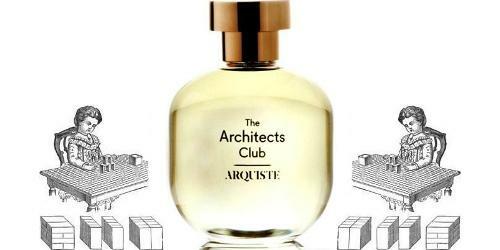 The Architects Club is a nice perfume, but it doesn't hold my interest: I’m not really a vanilla-perfume fan. But I can’t imagine vanilla-perfume fanatics finding anything new in The Architects Club, either. Several perfumes came to mind the moment I smelled The Architects Club; none of them are identical to it but they share a light/diffusive, semi-sweet vanilla-wood character: Diptyque Eau Duelle, Le Labo Vanille 44, Atelier Cologne Vanille Insensée and Valentino Uomo (the sheerest and least interesting of them all). The Architects Club is available in 100 ml Eau de Parfum for $190; the pricing of this scent astounds me (but I’d better get used to it…seems the cost of perfume rises each month). For buying information, see the listing for Arquiste under Perfume Houses. Note: top image, flanking the perfume bottle, via Wikimedia Commons. Haha! I’m surprised (and disappointed) that this was unexciting. I like most of the Arquiste offerings. CM…me too, this one just wasn’t a fit. My Tai Chi class was forced to move to a belly dance studio that has parent-child play classes on Saturday mornings above our class. Perhaps I’d find the disruptive noise more bearable if they were wafting suitable colognes! I used to live in Wallingford, so your description is kil.ling. me. I can see it and now. Whereas before I wasn’t interested at all, I now need to at least sniff it for the depth to add to the vision…..’Berner! You’ve spilt your vanilla milk! Apologize to Juniper!’ Thanks for the laugh. Yeah, I know Wallingford back from the old Food Giant days, but Kevin’s description cracked me up – giving Maria Semple some competition. Aparatchick…so Wallingford was rougher pre-Molly Moon and Trophy Cupcakes and …. I guess it still has a hint of “funky town” about it, but so many old businesses have given way to boutiques it seems. Quite funny review, Kevin. Love your humor. The alcohol was very strong to my nose and immediately turned me off because of that. Jessica: oh, good…can’t wait to read them! I would never have been able to get through the door of Mayfair’s smartest Art Deco smoking room in the 1930s, but I can’t imagine that it would have smelled of vanilla cupcakes. Leather, smoke, wood, sure, just not cupcakes. My vanilla needs are well filled by SDV and Havana Vanille, so thanks for saving me sample money on this one, Kevin. Yeah, vanilla is not what I’d expect at all as the principal note. Real cologne, Jicky, Hamman Bouquet, sandalwood, Cuir de Russie – I think it would have been a much more pungent mix. Noz: and the vanilla really carries through…from start to finish. I am a vanilla fan and I’m always looking for a summer vanilla. Vanille Insensée did not work for me. This sounds like a really expensive Vanille Insensée? La Vanila’s Vanilla Grapefruit (sometimes recommended as a summer vanilla) was too perfumey for me. Kindcrow: yep…this could be a summer vanilla…but as you said: an expensive vanilla. What’s your favorite vanilla, if you have one? Hajusuuri: the vanillas you’ll find in my cabinets are PODS…my vanilla obsessions are food related: black teas with vanilla bean, creams, custards, icings, cakes, infusions, glazes, syrups, sodas, Mexican vanilla liqueurs, you get the picture! HA! HA indeed! If you’re a messy eater, I bet you smell like a walking vanilla pod given your foodie vanilla predilections! Hajusuuri: I’ve been known to dab my wrists with double-strength vanilla extract while cooking…so, yes! On me it reminded me of Guerlain’s Angelique Noir but I’ll have to test them together to check for sure.